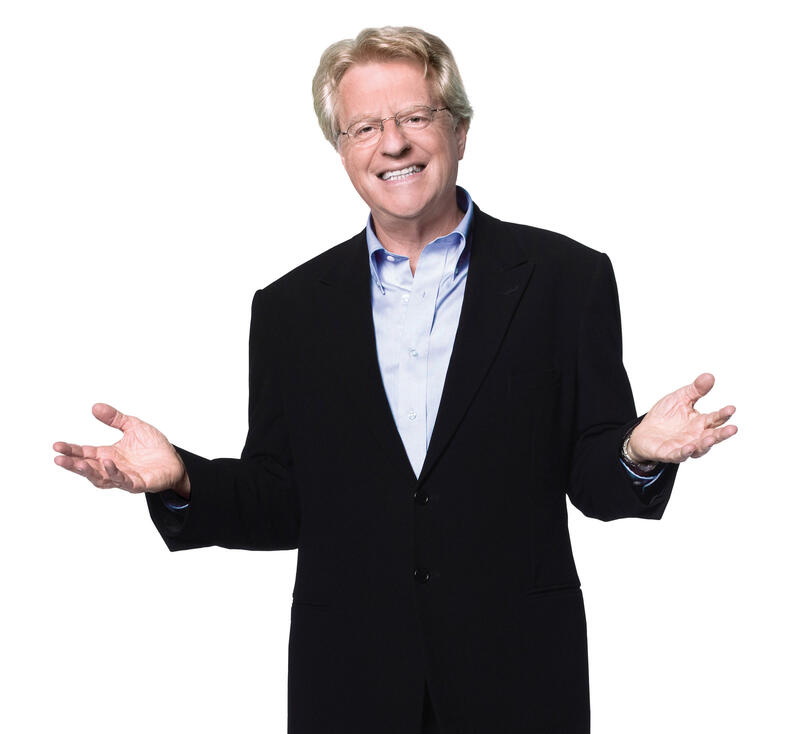 Multiple entertainment news websites are reporting that the "Jerry Springer Show" has stopped production after 27 seasons. Broadcasting & Cable broke the news that "Springer," which started at Cincinnati's WLWT-TV (Channel 5) in 1991, "has gone out of production." Jerry Springer taping a 1995 episode in Chicago. The CW network has picked up "Springer" for "multiple years" for its daytime schedule this fall -- but the CW plans to air only reruns and "preproduced" shows for now. Ironically, it's the same 3 p.m. afternoon talk show slot which the "Bill Cunningham Show" filled from 2012 to 2016. If CW executives "opt to order more original episodes," Springer's show "would go back into production" in the future, Broadcasting & Cable says. NBCUniversal, which owns the "Springer" show, renewed sister shows "Maury" (Povich) and the "Steve Wilkos Show" for two years. "Wilkos" also will air this fall on the CW (Channel 12.2). With the CW deal, "Springer" will be ending national syndication this fall on WSTR-TV (1 p.m., Channel 64) and Dayton's WRGT-TV (4 p.m., Channel 45). Springer's publicist declined to comment, referring questions to NBCUniversal in Los Angeles. After WLW-AM talk show host Bill Cunningham quit his TV show two years ago, the CW aired "The Robert Irvine Show" in the afternoons. It has been canceled. Both shows were produced by the Tribune, which is in the process of being acquired by Sinclair Broadcast Group. 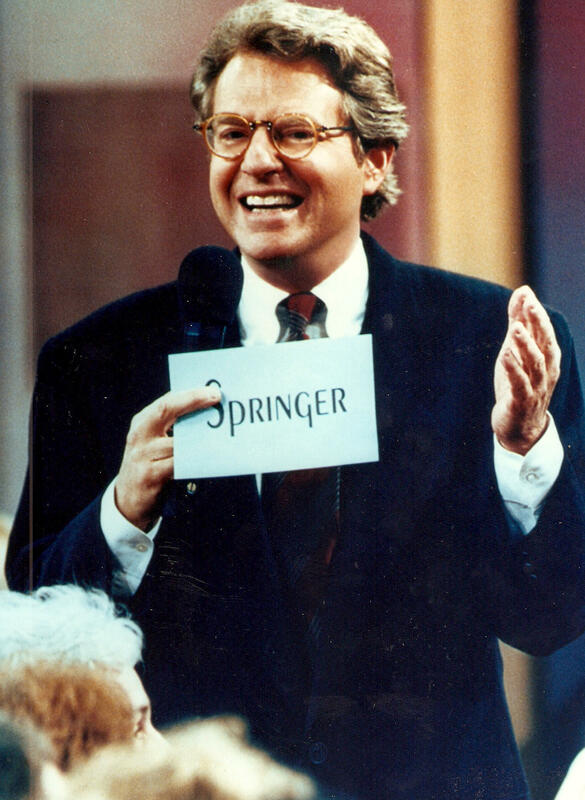 Springer, 74, started his daytime show in fall 1991 on WLWT-TV and sister stations owned by Multimedia Entertainment, which also produced Phil Donahue and Sally Jessy Raphael's respective syndicated talk shows. "Springer" went national in fall of 1992, when production moved to NBC's WMAQ-TV in Chicago as part of a deal for NBC stations to air the show. Universal Television bought the Multimedia Entertainment shows after Gannett purchased the company in 1998. 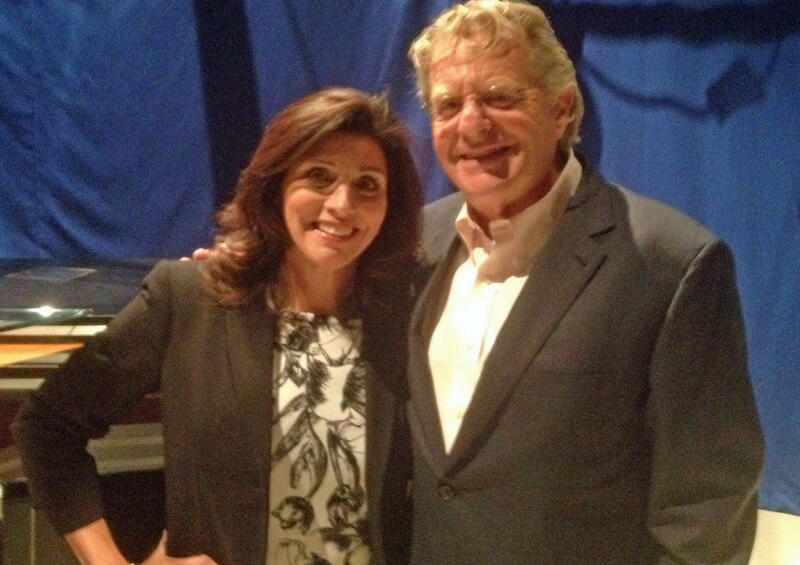 Norma Rashid and Jerry Springer at the University of Cincinnati in 2014. Springer, a former Cincinnnati mayor and councilman, continued as Channel 5's news anchor with Norma Rashid while hosting the daytime show for 17 months. He commuted daily to Chicago the last five months, until leaving News 5 in January 1993. When he shed his news anchor duties, the "Springer" show transitioned from dealing with serious family issues and political interviews into the outrageous relationship shows that made him popular. Some of the "Springer" shows were so sleazy that his former employer refused to air them -- like "I Married A Horse," or a show featuring a woman who slept with more than 200 guys in 10 hours. WLWT-TV, his former station, sometimes refused to air some of his shows that General Manager Jim Clayton called "disgusting." Channel 5 would air reruns of old shows instead. 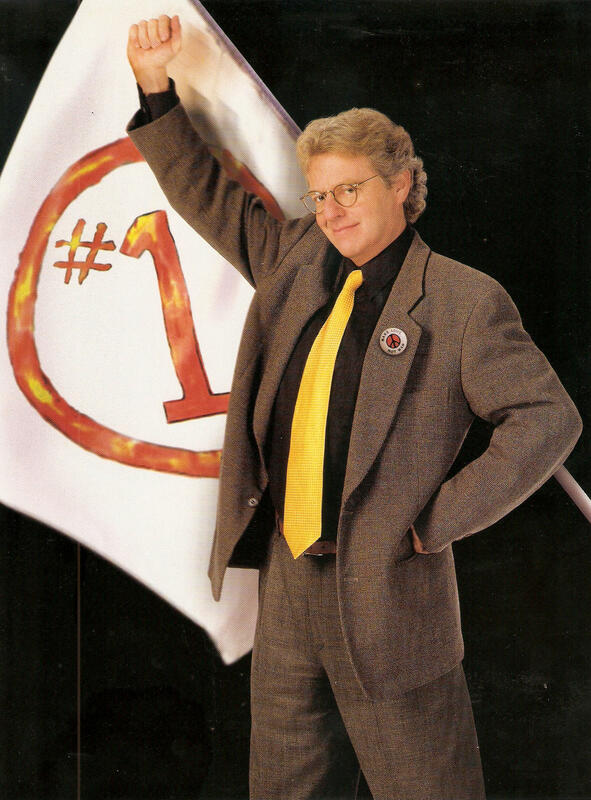 "Jerry Springer Show" promotional photo in 1999, after he beat "Oprah Winfrey" in the daytime ratings. 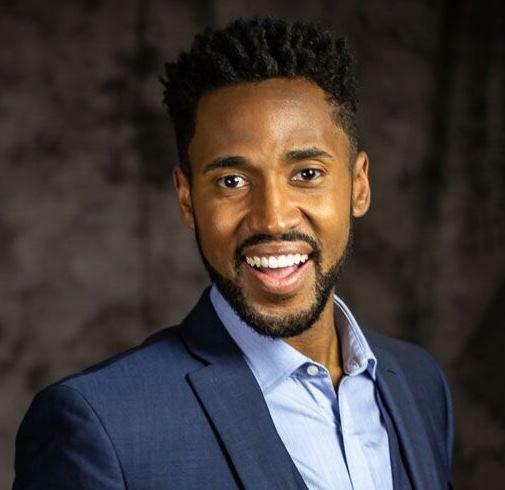 Springer parlayed his daytime TV fame into competing on "Dancing With The Stars," hosting "America's Got Talent" and the "Baggage" game show, plus guest appearances on "Married…. With Children," the original "Roseanne," "The X-Files" and "The Simpsons." His trashy TV series also inspired an opera. Leaving the TV show could clear the way for Springer to re-enter politics, if he desires. Springer, who started in TV as a Channel 5 commentator after an unsuccessful run for Ohio governor in 1982, has said many times in the past that he would not run for office while the daytime tabloid TV show was on the air. 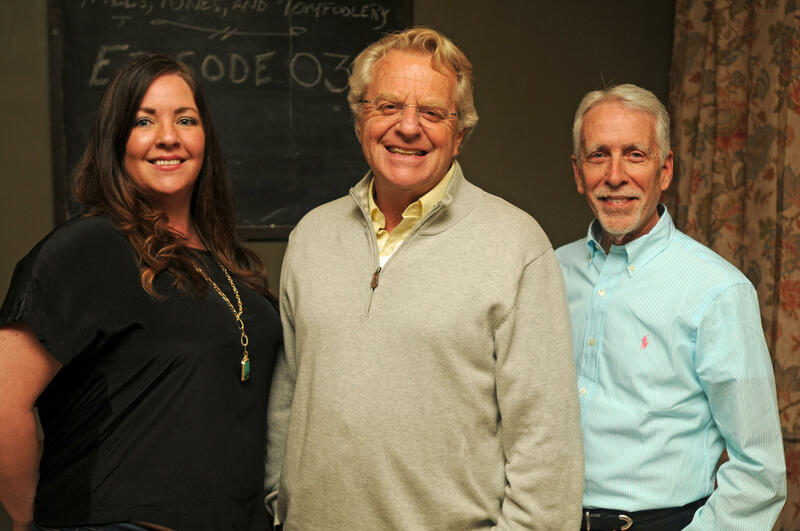 Springer records a podcast Tuesday night with Megan Hils and Jene Galvin at the Folk School Coffee Parlor in Ludlow KY.
Springer has actively supported Democrats for decades, prompting rumors that he might return to politics. Rumors again started last September, after he appeared at a Labor Day rally in Cleveland, that he wanted to run for Ohio governor in 2018. He talks politics and other serious issues Tuesday nights while recording his weekly podcast at the Folk School Coffee Parlor in Ludlow, Ky., with longtime friend Jene Galvin and Megan Hils. 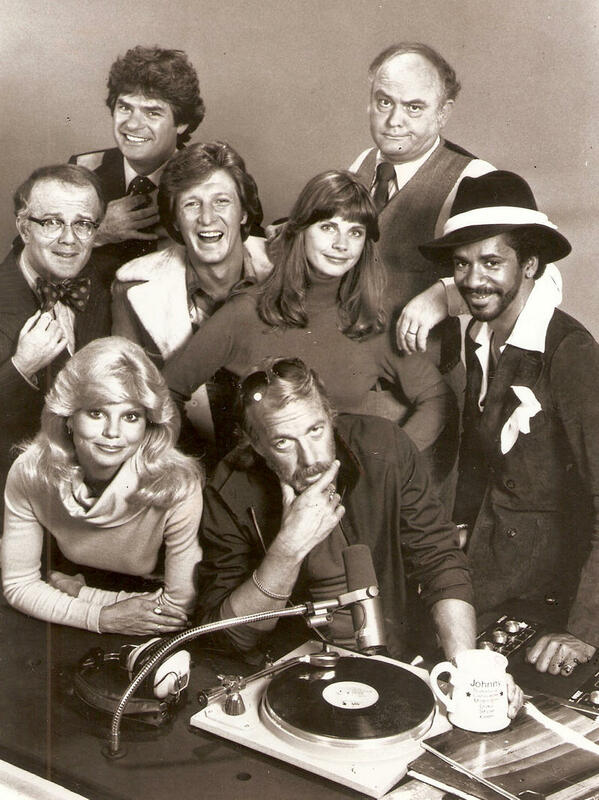 WKRP will be living on the air in Cincinnati again starting April 2. Dr. Johnny Fever, Venus Flytrap, and Les Nessman from the beloved CBS sitcom (1978-82) will be seen in reruns on Me TV, the classic television network broadcast by WLWT on Channel 5.2.